1. Ovarian reserve - As women age, there are fewer viable eggs left and in cases of early menopause, the eggs run out sooner than usual. 2. Menstrual cycle - As women approach menopause, the menstrual cycles may become irregular and shorter, further reducing the chances of conception. 3. Uterine causes - Abnormal anatomy of the uterus; the presence of polyps and fibroids can damage the reproductive organs as time passes, or worsen if not treated properly. 4. Lining of the womb - The Endometrium may become thinner and less hospitable to a fertilized egg. 5. Hormonal causes - Changes in hormones result in altered ovulation. 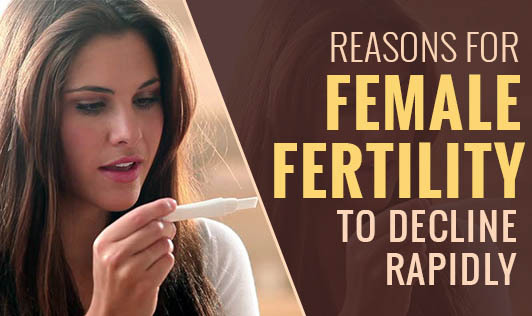 These hormonal changes lead to the release of an egg from the ovary and thickening of the endometrium in preparation for the fertilized egg when there may not be any fertilization that has occurred. 6. Damage to fallopian tubes - Any damage to the fallopian tubes (which carry the eggs from the ovaries to the uterus) can prevent contact between the egg and sperm. 7. Mucus secretions - Vaginal secretions become less fluid and more hostile to the sperm.